Yesterday, Nokia announced the new Lumia 610 in the UK with NFC connectivity. The company also announced the new BH-310 BFC and Bluetooth enabled headset. This product is specifically targeted at smartphone consumers who spend a lot of time driving. The headset can be used to connect to your smartphone via Bluetooth or NFC by just a single tap. The headset also comes with two microphones and Digital Signal Processing and has superior noise suppression and echo cancellation. It charges pretty fast and gives a long standby time and it comes with a nice cradle/holder that not only holds the headset but can also be used to charge the headset. The best part about the holder/cradle is that it automatically answers the call when picked up from holder/clip and turns off when put back and saves power. 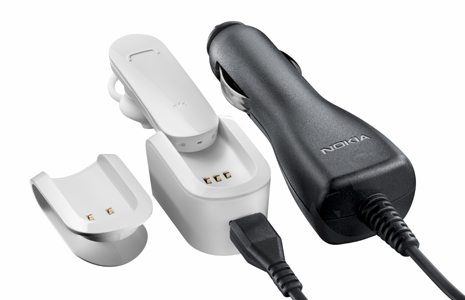 The headset can also be charged via a 12v car charger. It also comes bundled with three different sized ear-buds to fit your ear perfectly.